But you won’t want to skip it, that much I can guarantee you (especially the video of the month and the special coupon codes I have secured for you guys in the closeouts section!). The same can’t be said for the SBG Sword Forum however – which saw some significat design changes early in the month (indeed, some of you were in there when I was ‘painting the walls’ – which was probably a bit disconcerting! It was funny to read posts such as ‘Paul is on the move again!’ – lol). If you haven’t visited since the last issue of the digest, check it out – looks nicer I think (hope!). The idea is to make navigation even easier and clearer than before, as well as give it more of a modern look – and I think (and hope) you will like how it is going to turn out... (and once I am finished, the sister site will also be given the same treatment – and the two sites easily navigable back and forth depending if you are looking for reviews, or general information). As far as ‘surface’ changes go, the only one really worth reporting on is for the Sword Buyers Directory, which has seen the major sword sellers listed there get a ‘2.0 feedback’ area. The idea is for anyone who has dealt with these guys to leave a record of their experiences, and while it is pretty thin on the ground right now – I am hoping that it will be a useful tool for buyers to see exactly what other members of the community REALLY think about the various sellers – which I think is a great way of keeping vendors as transparent and accountable to the community as possible. Please have a quick look, there has been some reorganization there – and there is plenty of interesting feedback already left on our recommended sellers, but if you have had experiences with them yourself, be sure to give us YOUR $0.02 on each seller. Anyway, lots planned for August. And if it all goes to plan - you’ll see some dramatic and very positive changes to SBG’s interface early in the month, so to know what is happening and when, be sure to visit the SBG News section or better yet – subscribe to the RSS feed for up to the minute additions. 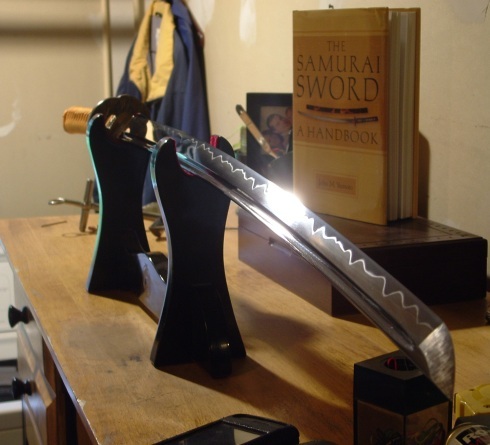 It is nearly ‘custom Katana’ time again! Speaking of which, I actually had some issues with the shortlist around 3 weeks ago and seem to have lost quite a few names from it, so if you have been waiting – it is probably better to be safe than sorry and add your name to the list again. Not long to go now guys (and for those of you who are waiting for your sword from a couple of months ago, we should be shipping them out any day now!). However, there was one significant and very informational ‘laying the groundwork’ article added by Michael ‘Tinker’ Pearce himself on what makes a good european style sword that every Euro-sword enthusiast simply MUST read and understand. If all goes to plan, you’ll see several new articles added in August (I have nearly finished one myself on the different types of steels modern production swords are made fro, but alas ran out of time), so be sure to check the SMG Newsfeed often - or better yet, use the RSS feed to get announcements in your RSS reader. P.S. Speaking of running out of time, unfortunately Dan was not able to get this months edition of collectors corner ready due to work commitments. I know all too well what it is like and I am sure you guys do too, but don’t worry – it’s not permanent! If you are a gamer (and obviously, if you are reading this – it’s a given that you like swords too!) then this is the thread for you! Do you remember your first sword? Well, this one was like a trip down memory lane for me – and the Sticklestad Viking sword is definitely one of my faves. LoTR Swords Before the Movies! Yes, there were Lord of The Rings Swords BEFORE the movies came out – and in this excellent thread we see some pics of what they looked like! There are quite a few different styles of hamon (Katana temper lines) – and everyone seems like a different one. Lots of pics of beautiful patterns, have a look and see which one YOU like the best! 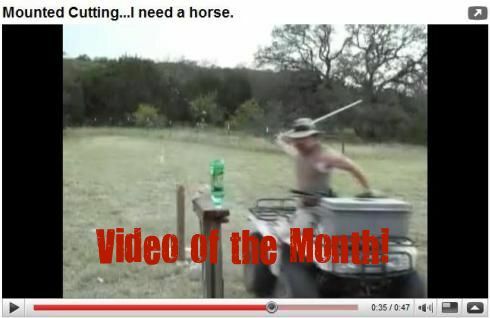 How could THIS video NOT be the video of the month! First off, it has our very own SHOOTERMIKE in it – swords (natch) and his – er, horse, with a quick and hilarous demonstration of mounted cutting..! A selection of hot product discounts and clearouts from our affiliated vendors. Grab a bargain and support SBG at the same time! SWORD N ARMORY And SWORDS OF THE EAST! 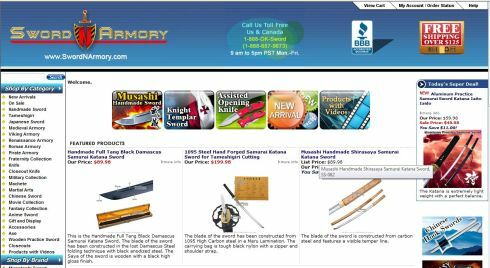 I’ve managed to get a couple of very cool discount coupon codes for you – both for a whopping 10% of their ENTIRE RANGE of swords (and other items) from two very respected sword sellers, Sword N Armory and Swords of the East. 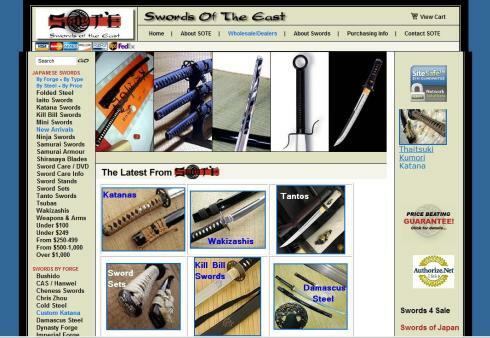 For Swords N Armory the coupon code is: SBGFRIEND (all capitals, no spaces). For Swords of the East, the coupon code is: off10now (all lowercase, no spaces). I’ve had a bit of a look and a play around with a few items to see how much you will save using these, and we are talking some serious dollars... (in some cases, these coupon codes bring the prices down extremely close to WHOLESALE!). Hope you enjoyed the August edition of the digest – don’t forget to stay tuned for the new look SBG this month! Until then – stay safe and have fun with swords!